Latest News: You can make your bookings for Le Mans Classic 2020 now! The provisional dates for the event are the 3rd – 5th July 2020. Please call us now to reserve all your tickets for Le Mans Classic 2020. The simplest and most popular way to experience the Le Mans 24 Hours is to join the thousands of people that drive to Le Mans and camp at the circuit. 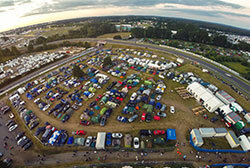 Travel Destinations' have two exclusive trackside campsites available for the Le Mans Classic. For those that like a little luxury at Le Mans, our Event Tents are our "Glamping" option. Giving you a large pre-erected tent complete with all your accessories. 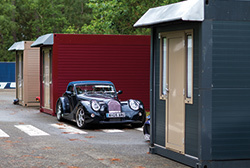 Our Flexotel Village cabins will provide your own private bedroom at the centre of the circuit. Comfortable beds & a lockable room in our secure paddock area. For the Le Mans Classic most people choose to stay on the circuit itself. By choosing this option you will be camping as close as possible to all of the on-circuit action throughout the weekend’s racing. The atmosphere and camaraderie between all race goers on circuit is great and you will be able to experience it all. For the Le Mans Classic 2020 Travel Destinations will have two private trackside campsites, Hunaudieres and Porsche Curves. They will be located at Hunaudieres (on the inside of the Tertre Rouge corner) and on the outside of the Porsche Curves bend. The campsites are controlled by Travel Destinations staff and provide all our guests with on-site security and serviced showers and toilets. The campsites are adjacent to the track so you cannot be closer to the on circuit action with a viewing bank right next to the campsite. For those without a tent we have a “Glamping” option with our Event Tents. 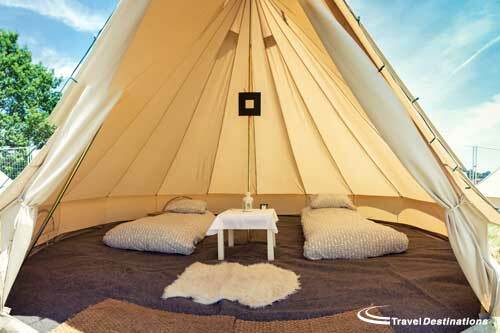 The Event Tents are large pre-erected bell tents with carpet, mattresses & all bed linen provided. The Event Tents also benefit from all the facilities at our Porsche Curves camspite. For those that don’t like camping then we are pleased to also offer our Flexotel Village in the centre of the circuit. These are comfortable cabins that provide your very own bedroom in the centre of the circuit. Each room comes with two proper beds and all the bed linen. 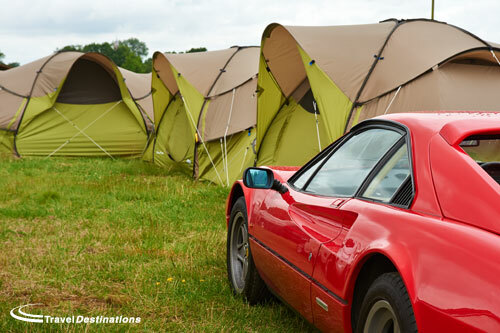 In addition to our private campsite there are also a selection of public campsites that are open for the Le Mans Classic 2020. These campsites are controlled by the circuit and provide marked pitches with a limited number of showers & toilets in each campsite. The public campsites are all just a short walk to the track and paddock. To book any of these options please do call us on 01707 329988.